I absolutely love when I get fun and quirky commissions. Michellle wanted me to capture her on a unicorn float. It was such a fun concept that reminded me of an older illustration I did, see that HERE. I knew I had to give it a different spin. Michelle is such a vibrant person and adding different shades of pink and browns like mauve and taupe and make it pop with hints of magenta and fuchsia. The color combo is something I definitely have to try again. If you will like to order your own illustration you can see my rates and contact me HERE. There is absolutely nothing that makes me happier than when my pieces get to their new owners. This canvas piece went through so many stages, after all this time I’m happy to know she’s complete and cared for. 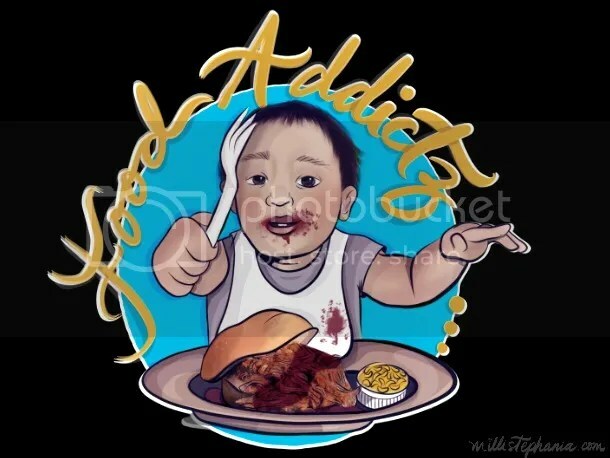 Babies eating pulled pork…. How is that not a great idea for a logo? I created this piece for the sweet Justine. She and her husband are opening up a restaurant in the Jacksonville are in Florida, so if you’re close.. go grab some grub! Creating logos for customers has always been a bit tricky for me. Finding a balance between what they are envisioning in their mind, and making sure I’m doing my best to create that.. can be hard. Client Pam reached out to me, she’s been wanting a logo of her own, and was tired of finding images on google that 1. didn’t belong to her, and 2. were not personable. After speaking about what she wanted to achieve, we worked together pretty effortlessly. So I present to you her logo. When I gave her the finished product, she was so happy with the end result, and that only made me so much excited to start taking on different kind of clients. So, thank you Pam, for helping me make the transition so painless. 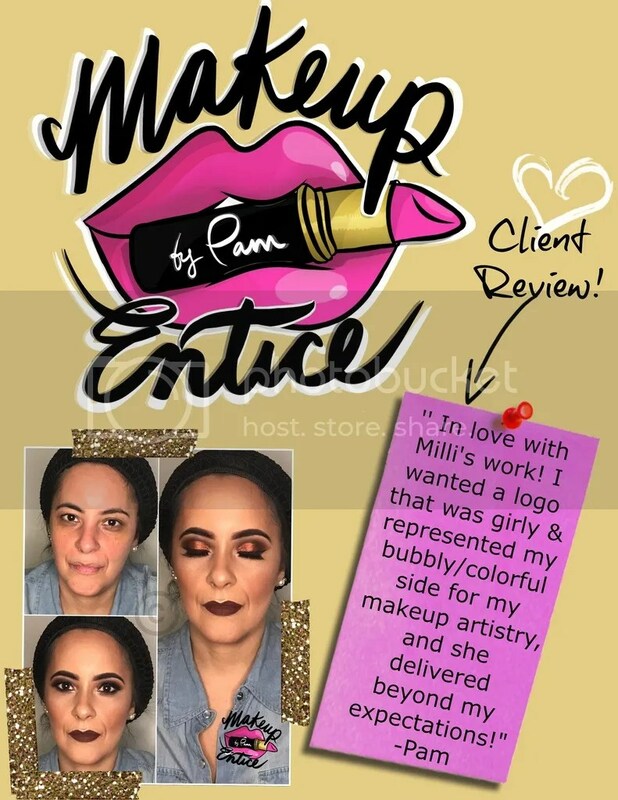 Check out her on makeupentice.com or on ig at @makeupentice for your makeup needs. It’s been quite a while since I have posted New Artwork that was on canvas. Let’s face it, painting beautiful women on beautiful women is usually faster and much more entertaining. I promised myself I had to get back to canvas work. And I happened to do just that. Long time friend Shanicka (and when I say long time, I mean all the way back to 7th grade) recently found me online. I was not only happy to hear from her, but I also blushed when she said she was happy to know that art was still a huge part of my life. When I was a kid, I used to draw peoples names on a a piece of paper and sell them for a dollar! But I guess it goes to show, how some things never change and better yet, some things just get better in time, Sometimes when you truly have a passion in life, it just follows you everywhere you go, and I for one, am glad that my work has grown so much over the years. 1. Involve purple 2. Not too scandalously dressed & 3. In a classroom environment. Boom! That seemed simple enough. After she picked her size, I got to work immediately since I already had an idea on my mind of what I wanted it to look like. I know I wanted to add some gold tones in there, which you can see on my infamous checkerboard floors and on the globe. I originally started the chalkboard in the background as an actual real chalkboard. I wanted her to be able to write on the artwork as well. When almost done, I decided that wasn’t the best idea, since I wanted to add varnish to seal the paint, and let’s face it, chalk dust is the worst. I will say this, I loved how the purple and splatters of orange stand out in the background, giving it a galaxy feeling. Because you know, Learn a little, you just might discover the possibilities in the universe. It took some time to actually finish this piece, because let’s face it, I got a little lazy, and kind of lost my train of thought in the middle. But I’m so glad, I got to finish this piece. Like I said in a previous post…back on my hustle! Now, what do you guys think? Ps. If you would like your own personalized piece, I am currently open for commission requests. Please emai me at 2minxinx@gmail.com for more information, or please visit my F.A.Q page.